Forest fires have been raging in pine forests of Dharamshala for the last three days, causing a significant loss of tree cover. Although the exact extent of fire is not clearly known, at least 618 sites reportedly caught fire in this region. Strong winds in the region on Sunday morning further pushed the fire to other areas, including near Dharamshala cantonment. This is the time of the year when pine trees shed their leaves, covering large chunk of open land within forests. With summer temperature already hovering in mid-30s, the pine needles take hardly three to four hours to get completely dry. These heaps of needles become highly inflammable and easily catch fire. However, there is another facet to it: practice of waste burning by the communities living in the vicinity of these forests. "In absence of a proper waste collection and disposal system, the communities find it convenient to burn their waste. 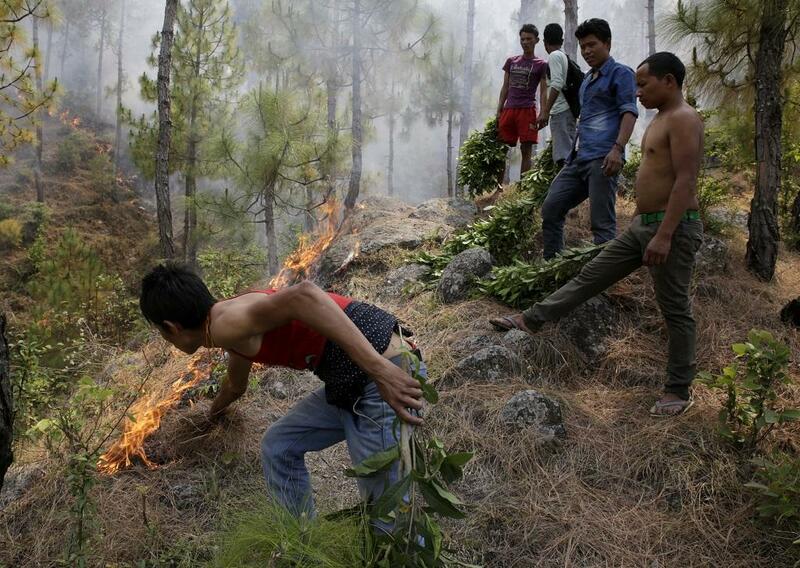 Although they keep a watch and stand close to the burning garbage, embers often burst out to nearby forests, triggering a massive fire," says Dharmesh Kumar, Sub-divisional Magistrate, Dharamshala. The forest department has been planting pine saplings in the region for the past few decades due to high survival rate of the tree. There are 27,910 hectares of pine forests in the Dharamsala circle, which comprises 20 per cent of the total forest area in that circle. However, these trees create problems for the forest department as well as the native farmers. “As pine trees produce biochemicals that do not allow any kind of vegetation to grow, the forest department does controlled burning of pine forests to ensure there is growth of grass during monsoon months and animal fodder is available. The villagers, at times, take this exercise upon themselves and set these needles on fire, which slowly spreads beyond their control. Recently, a cabinet meeting was held to explore possibilities of making commercial use of pine needles,” adds Kumar. Experts say that there is technology available to convert these pine needles into combustible bricks. Closer to the capital city, Kasauli has already been reeling under high maximum temperature. It has also witnessed a massive forest fire in area around the Air Force Station. A helicopter was pressed into service by the defence authorities on May 26 to douse flames. Despite suffering from depleting water level, water had to be sourced from the Sukhana Lake in Chandigarh to douse fire. “Whoever promoted pine trees and planted in this state has done great disservice to the people. Why can we not phase out pine trees and replace them with deodar (Cedrus deodara) or ban (White Oak)? A state, which is already reeling under drinking water crisis, has to now use its water to stop forest fires. If we do a comparative study between places that grow only pine and deodar, we will see that incidents of forest fires are much less in the latter,” Kumar affirms. While pine trees are the principal convict, a part of the blame also goes to extremely high summer temperature prevailing in the region in the last few days. Heat wave conditions continued unabated in the lower hills of Himachal Pradesh, with Una registering the hottest temperature at 43.6 degrees Celsius on Sunday. Maximum departure from normal temperature in most districts has been high. According to the circular issued by India Meteorological Department on May 27, maximum temperatures in some parts of Himachal Pradesh were “appreciably above normal” (3.1°C to 5.0°C). In fact, Himachal Pradesh has been witnessing a steady increase in maximum temperature over the decades. According to state-level climate change trends released by the IMD, the highest increase in annual mean maximum temperatures during 1951-2010 was observed in Himachal Pradesh (+0.06°C/year). In a sign of temporary respite, the local meteorological office has forecast rains or thundershowers in the mid hills for five days from May 28 to June 1 and rains and thundershowers in the lower hills on May 30 and 31.